The ultimate deep cleansing treat for your blemish prone skin, with a FREE organic cotton muslin flannel worth £3. Dr Hauschka Clarifying Steam Bath prepares skin for deep cleansing. It is intended for blemished skin prone to inflammation. Moisture and warmth open the pores and loosen blackheads and congestion prior to application of Dr Hauschka Clarifying Clay mask. Dr Hauschka Clarifying Steam Bath acts to deep cleanse and purify the skin. 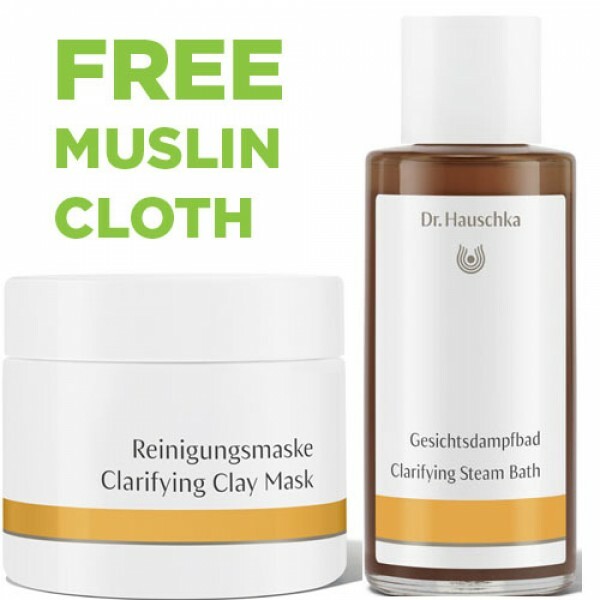 Follow with Dr Hauschka Cleansing Clay Mask, leave on for the specified time and then use the Free Organic Cotton Muslin flannel to rinse it all away leaving your skin deep cleansed and beautifully soft. Active herbal extracts include Daisy (Bellis perennis) extract, which has been used traditionally for blood purification and for treating skin disorders. It stimulates the elimination of waste products.